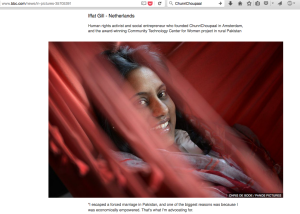 There is now a sharp contrast between the empowerment modern technology has granted women, and the rights our male-dominated society allows them to enjoy - Iffat Gill on Women and ICTs in Pakistan. The Code To Change 2016 Amsterdam; We Rocked! 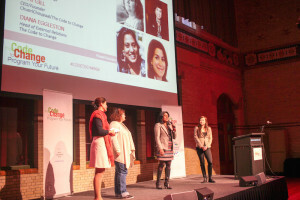 Comments Off on The Code To Change 2016 Amsterdam; We Rocked! 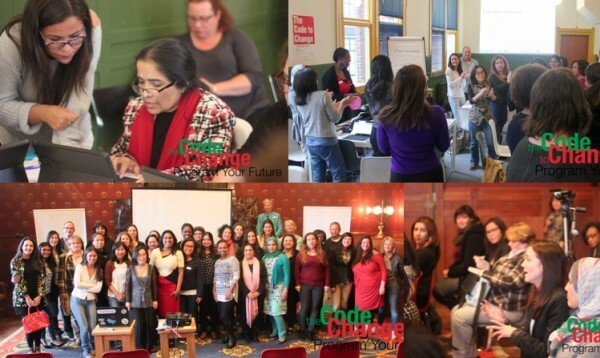 The Code To Change 2016 (kickoff for the mentoring program) was back with a bang this November! The speaker line-up fr the second edition was even more amazing than last year! Over 20 Tech leaders and emerging leaders from across the industry shared their stories and journey into the IT sector. The topics included security, big data, high performance computing, design, sharing economy, art and tech, Artificial Intelligence, social media, digital marketing. The talks inspired our participants (and graduates Code Newbies from the Code To Change bootcamp) to pursue their dreams and learn new digital skills in order to join the technology sector. Please take a look at the Conference description here. For conference programme details, see here. 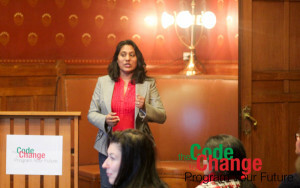 Watch highlights from the Code To Change conference 2016 here! 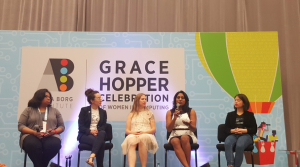 The Code To Change was invited to be part of #WomeninTech panel discussion at the Grace Hopper Celebration (an Anita Bog Institute event). 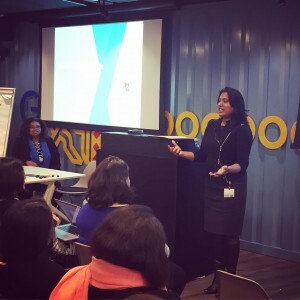 The event was attended by 15,000 women technologists from around the world. The panel highlighted the work of The Code To Change, Women Techmakers, ChickTech and Pipeline Angel investors to encourage girls and women to enter, stay and advance in tech roles and career paths. The discussions focused on how local communities and organizations are involved across all tech programs to impact diversity across the tech spectrum spanning international societies. The panel was hosted by Anita Borg Institute’s Systers community and moderated by the amazing Rose Robinson. I had a great honour to speak at the lunch meeting hosted at the German Ambassador’s residence in the Hague, Netherlands. I spoke about the role technology can play in the empowerment of women, particularly those who are under-privileged and have limited opportunities. I spoke about digital literacy and how ChunriChupaal and The Code To Change is empowering women to embrace new challenges in life and learn digital skills to reach their full potential and join the digital economy. The event was attended by 20 diplomats from five continents. Take a look at write-up at the official website of the mission in question! 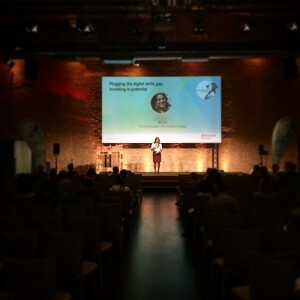 Excited to share that I was invited by the Euroforum folks to give the closing keynote at the Ada Lovelace Festival in Berlin, Germany this October. The festival is an annual event which celebrates contribution of women to the emergence of the digital age. Among them was Ada Byron Countess of Lovelace (1815–1852), a mathematician now considered a software pioneer, after whom this event is named. In the mid-19th century, she developed a program for Charles Babbage’s “Analytical Engine”, a forerunner of the modern computer which was sadly never completed. The keynote highlighted the importance of investing in potential to plug the digital skills gap through The Code To Change program. I was selected as High Level Track Facilitator, an innovation at the World Summit on the Information Society – WSIS Forum 2016 to move from policy speeches to an interactive dialogue and actions. I moderated the high level policy session on “Financing for Development and the Role of ICTs.” One of the most interactive policy sessions, the panel on ‘financing for development’ included Ministers and high level government officials from United States, Namibia, Portugal, Argentina, Tunisia and Azerbaijan. 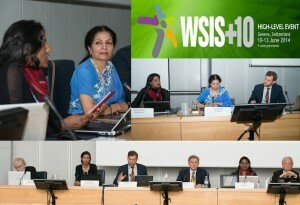 With 1,800 participants from 140 countries, including 85 ministers and 250 high-level representatives this year, the WSIS Forum is growing in importance. 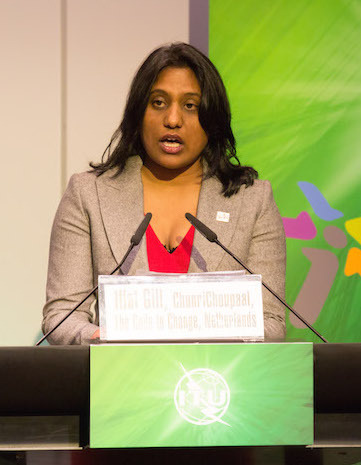 Last December at the WSIS+10 Review, the outcome explicitly called for the close alignment between the WSIS process and the 2030 Agenda for Sustainable Development. As the first meeting after that review, the Forum was an opportunity to gather the wider community to discuss the way forward. More details at the ChunriChoupaal’s website on this link. 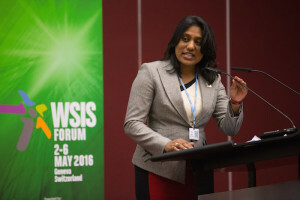 I was invited to speak at the high level policy session as a High Level Speaker (civil society) on Inclusion at WSIS Forum 2016 which took place in Geneva,Switzerland. I highlighted the importance of diversity and inclusion of women in the existing workforce. My intervention included challenges faced by community leaders and grass-root organisations to implement digital literacy programs for girls and women. Other issues I highlighted were unconscious bias, safes spaces (both online and offline) for women to learn, work and express themselves, attitude of men towards inclusion. I am proud to have chaired a thematic workshop on gender digital divide and digital inclusion for financial and social empowerment three years in a row. This year’s workshop focused on the e-Skills gap and how The Code To Change is bridging this gap. It was an honour to be one of the community leaders to initiate a community for women in technology in Amsterdam, ABI.Amsterdam, in collaboration with Anita Borg Institute for Women in Computing. I spoke about “Digital inclusion: the importance of e-skills training for economic empowerment.” It was an honour to share the stage with Rose Robinson from Anita Borg Institute, who spoke about he role of local communities in empowering women in technology. The sponsors included Google UK and eBay-Marktplaats. For details of this event, please go to the event page on this link. It was a great experience for me to share stories of women empowerment from Pakistan and how my work in the Netherlands to empower women through digital skills is helping them explore careers in the technology sector. 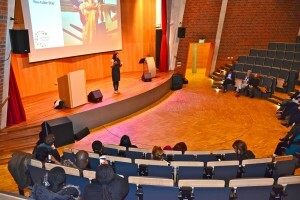 The lecture focused on how technology can play a role in social and economic empowerment of women who are confined to their homes due to cultural norms and have limited contact with the outside world. I am honored to be featured in Internet Society’s ‘Shine The Light’ campaign which features digital trailblazers and leaders who are using technology to empower themselves and others. The campaign launched by Internet Society and featured on BBC, aimed at recognizing the many contributions made by women today to the development and growth of the Internet. By encouraging others to “Shine the Light” on women who are using the Internet to innovate and make a difference in people’s lives, the organization hopes to celebrate the online achievements of women and draw attention to the issue of gender inequality when it comes to Internet access. 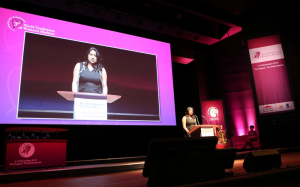 I had the honour to be the opening speaker for the economic empowerment track at the 3rd World Conference of Women’s Shelters on 4th of November in the Hague, Netherlands. The dignitaries included Queen Maxima of the Netherlands and Crown Princess Mary of Denmark. I was the speaker for “I am that Woman” theme. 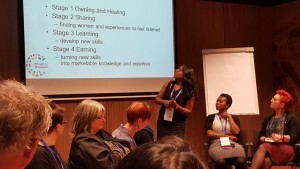 I hosted a workshop: “Digital Highway to Independence for social and economic development” at the 3rd World Conference of Women’s Shelters on 4th of November in the Hague, Netherlands. The dignitaries included Queen Maxima of the Netherlands and Crown Princess Mary of Denmark. The 3-day Code To Change e-Skills bootcamp and conference in Amsterdam just blew our minds! It was an amazing experience to lead this three day event for bridging the digital skills gap in connection with the European Code Week 2015. The event introduced participants to e-skills and different fields of technology industry. 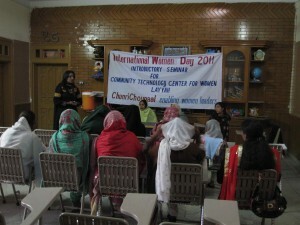 This initiative was brought to the public by ChunriChoupaal’s leaders and sponsors on a volunteer basis, through the shared belief that women deserve to have their talents developed and to achieve economic independence and that employers deserve to benefit from the full range of skills humanity has to offer. The energy, the passion, the drive and dedication of amazing participants, the wonderful mentors, volunteers and speakers; We are in awe. Thank you for a wonderful journey of learning, teaching, debating and helping each other to make steps towards empowerment. Thank you to all our supporters! For details on the event, please see the Code To Change project page. 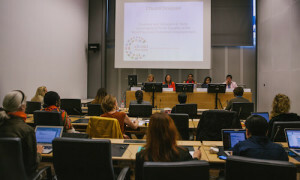 I am happy to share that we presented the results of our ‘Work To Equality‘ campaign at the World Summit on the Information Society- WSIS 2015 in May in Geneva, Switzerland. The session looked at different experiences of organizations that are working for gender equality, both internally and externally in their organizations. With these different visions and programs, we will have a better insight about what can be done to achieve #WorktoEquality. This workshop generated a debate to raise awareness and to collect possible suggestions and solutions for addressing the issue. The panelists included Mine Ogura, head of Work To Equality campaign, Monique Morrow-Cisco, Cheryl Miller-Verizon, Catherine Mesot-Catalyst. Remote panelists included Rifat Arif- Young Digital Leaders, Hanna Luden- consultant and Miriam Tocino- Amsterdam Women in Technology and I had the honour to chair the workshop. Details of the workshop can be seen here and recording can be viewed here. 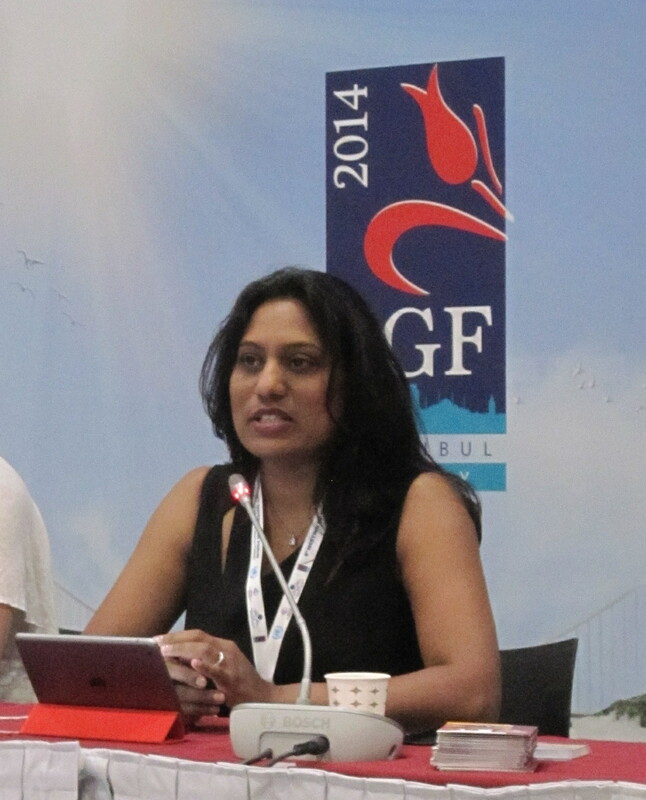 I had the pleasure to share my story of digital empowerment at the UN’s Internet Governance Forum 2014. 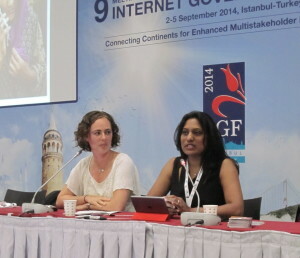 The Internet Governance Forum (IGF) took place in Istanbul, Turkey from 2 to 5 September. This UN-initiated body is a multi-stakeholder, non-decision making forum of global importance for forward-looking discussions on Internet issues. 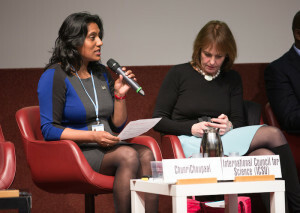 I had the opportunity to present my women empowerment initiative ChunriChoupaal at the flash session. 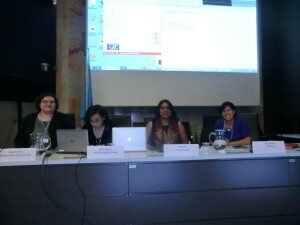 This session was chaired by Leana Mayzlina of World Pulse. I highlighted the issues faced by girls and women to access trainings related to the use of modern information and communication technology and how my women-only center was sensitizing women and girls and exposing them to new horizons of social and economic empowerment. Female Digital Literacy in Europe- How different is it from other parts of the world? Comments Off on Female Digital Literacy in Europe- How different is it from other parts of the world? A few years ago, I moved to Amsterdam. Amsterdam is home to a hundred and seventy eight nationalities; the ethnic makeup of Amsterdam being 49.5% of Dutch ancestry and 50.5% of foreign origin. I am originally an activist specialized in women and youth empowerment projects. 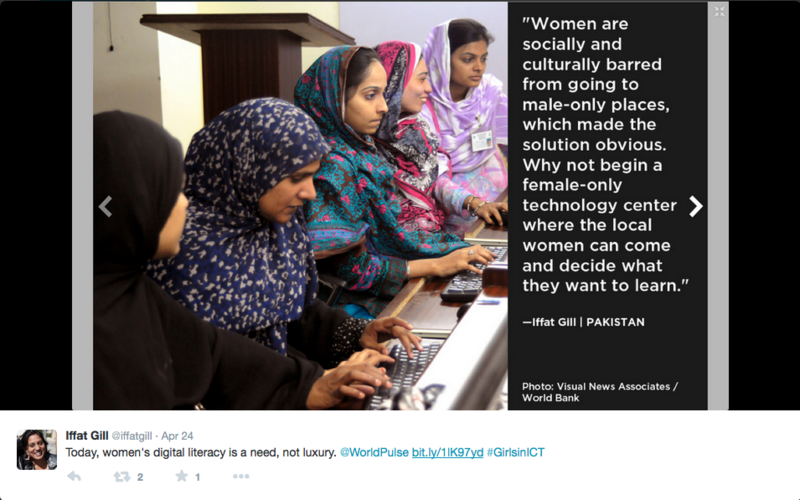 Due to my background in projects to improve female digital literacy in Pakistan, I mostly thought of the lack of resources and opportunities in the developing world. It was after I moved to Europe, that I got the opportunity to observe the digital literacy situation in a cosmopolitan city like Amsterdam. I started working with women groups, networks and organisations in Amsterdam, working with different nationalities, ethnicities and backgrounds. During my interaction with these groups, I discovered that digital empowerment, especially for women, was needed here too! 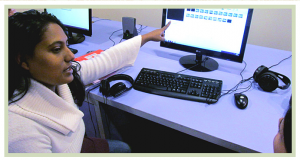 Digital Literacy top priority for International Girls In ICT Day 2014! Comments Off on Digital Literacy top priority for International Girls In ICT Day 2014! The International Girls in ICT Day is being celebrated globally this year today, on 24 April 2014. The purpose of celebrating the International Girls in ICT Day is an effort to provide an opportunity to empower and encourage girls and young women to consider studies and careers in the growing field of ICTs. Shadows from the Present | Powered by Mantra & WordPress.